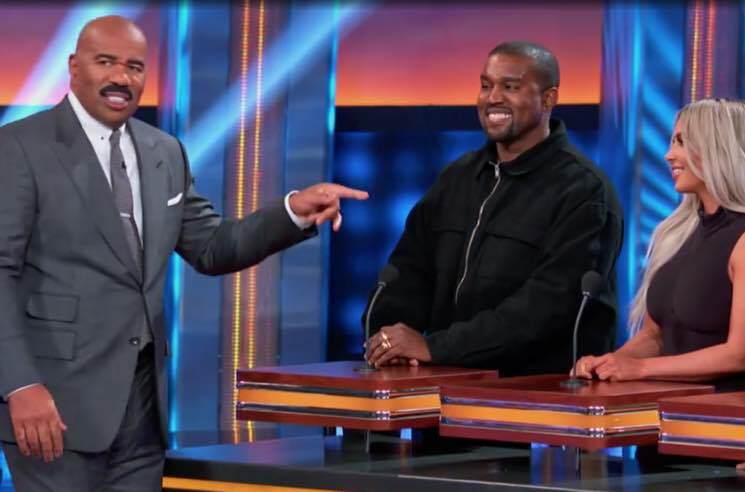 Continuing his streak of unusual album promotion, Kanye West appeared on the season premiere of Celebrity Family Feud last night (June 10). The rapper, his wife Kim Kardashian West and three of his cousins (probably not the laptop-stealing one) faced off against Kim's family of reality TV and social media stars, including Khloe Kardashian, Kendall Jenner, Kris Jenner, Kris' mother Mary Jo Shannon, cousin CiCi Bussey and family friend Jonathan Cheban. Both teams were competing on behalf of the Los Angeles Children's Hospital, and it was the Kardashian-Jenner clan that came out victorious (though the West family did win $25,000 for the charity during the Fast Money round). Canadians can watch the full episode here via CityTV. See some highlights down below. West, of course, has been on an album-releasing spree over the last few weeks, producing Pusha-T's DAYTONA, as well as putting out solo record ye and a joint album with Kid Cudi called Kids See Ghosts. You can order ye and Kids See Ghosts (or both!) on vinyl via Umusic.